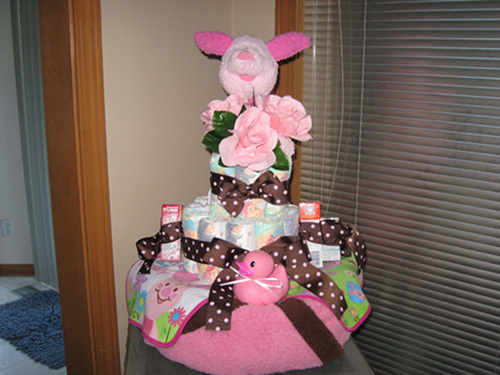 Even Eeyore would get excited about this Piglet Diaper Cake! A perfect complement to a Winnie the Pooh theme or a Piglet theme all by itself, this Piglet diaper cake is a clever and creative flair for your baby shower. Pamela from Macomb, Michigan submitted this wonderful diaper cake for the rest of us to enjoy. She also shares her instructions, tips and encouragement on making diaper cakes. This website is a free resource of ideas for all things baby shower, and it is generous and helpful readers like Pamela who help make this website the best source of baby shower ideas on the web!! So Thank You for sharing Pamela! 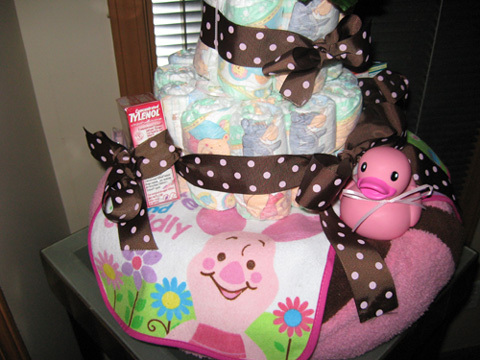 If you have a diaper cake and/or ideas that you would like to share, submit it here! I am a busy graduate student. I do not have any children of my own, but all of my friends are starting to have babies. I wanted to make something for my good friend that was unique, creative and personal. I stumbled upon this website and thought hey I can do that. I looked at all of the other cakes people submitted on the site and tried to incorporate a a bit of everything I liked. I used a bottle of baby lotion, although I really liked the pedialyte idea someone else used. I wrapped a very soft fleece like blanket around the bottom tier of diapers and affixed baby pins on the back. This added a cute decorative back to the cake. I also used clear hair ties, that you can get at any local pharmacy to hold the diapers together individually. I did have a hard time finding a large enough rubber band for the bottom piece, so I also used a large cotton stretchy head band, it worked great. I chose to use piglet because it was a girl and the piglet was on sale, plus was the same texture as the blanket. I wanted a more elegant look, so to hide the top of the bottle I bought satin pink flowers, they were only $3.00 for a bunch. i knew the baby shower would have about 100 people at it, large! So I affixed medication and gas drops on the sides. I figured that you can always use that! I actually was not able to attend the party because I had classes, but my friend dropped it off for me. From what I heard, the mom-to-be asked my friend where I bought it at. When I eventually got to see the mom-to-be she was impressed and didn't want to take it apart!! Overall, this site was great with directions. I recommend anyone to try it. Thanks Pamela!! Your friend probably still hasn't taken it apart yet - it is darling! After looking at this piglet diaper cake, you just might want to learn how to make your own diaper cake - find the instructions right here !